It has been a long road for PC players but now they can rejoice as Grand Theft Auto V has finally come. Grand Theft Auto V for PC offers players the option to explore the massive world of Los Santos and Blaine County in resolutions of up to 4k and beyond as well as the chance to experience the game running at 60 frames per second. GTA V for PC offers players a huge range of PC-specific customization options, including over 25 separate configurable settings for texture quality, shaders, tessellation, anti-aliasing and more, as well as extensive support and customization for mouse and keyboard controls. Additional options include a population density slider to control car and pedestrian traffic, as well as dual and triple monitor support, 3D compatibility, and plug-and-play controller support. GTA V for PC brings the debut of the Rockstar Editor, a powerful suite of creative tools to quickly and easily capture, edit and share game footage from within Grand Theft Auto V and Grand Theft Auto Online. The Rockstar Editor’s Director Mode allows players the ability to stage their own scenes using prominent story characters, pedestrians, and even animals to bring their vision to life. 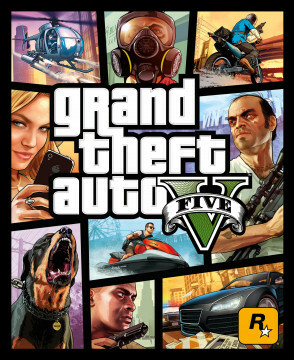 Along with advanced camera manipulation and editing effects including fast and slow motion, and an array of camera filters, players can add their own music using songs from GTA V radio stations, or dynamically control the intensity of the game’s score. Completed videos can be uploaded directly from the Rockstar Editor to YouTube or the Rockstar Games Social Club for easy sharing. Soundtrack artists The Alchemist and Oh No return as hosts of the new radio station: The Lab FM. The station features new and exclusive music from the production duo based on and inspired by the game’s original soundtrack. Collaborating guest artists include Earl Sweatshirt, Freddie Gibbs, Little Dragon, Killer Mike, Sam Herring from Future Islands, and more. Players can also discover Los Santos and Blaine County while enjoying their own music through Self Radio - a new radio station that will host player-created custom soundtracks. Existing players can transfer their Grand Theft Auto Online characters and progression to the PC from any current platform. For more information about Grand Theft Auto V and Grand Theft Auto Online for the PC, including minimum and recommended system specifications, check out www.rockstargames.com/V/pc. GTA V Out Now on PC - At long last PC players can experience Grand Theft Auto V in all its glory with advanced features beyond the newest consoles.